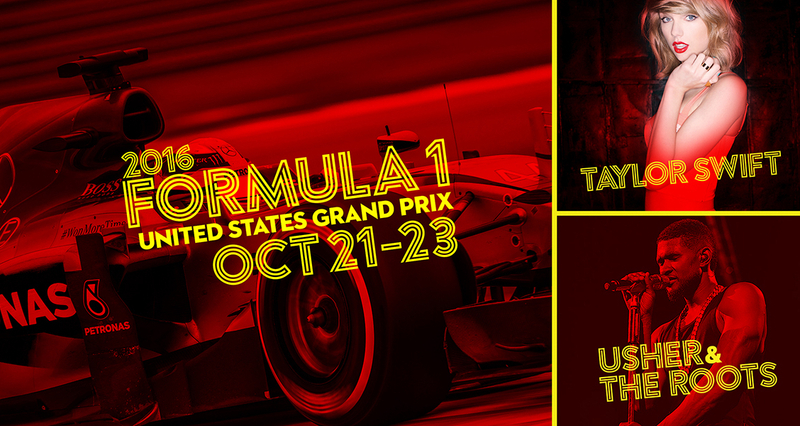 Welcome to Circuit of The Americas for the 2016 Formula 1 United States Grand Prix! With many of you visiting for the Taylor Swift and Usher & The Roots concerts taking place over USGP weekend, we wanted to give you the scoop on how things will work. Below is all the information you'll need to get in the gate and have the time of your life. Parking lots open at 7AM on Saturday and Sunday for those who have have purchased a parking pass. If you have not, on-site parking is now sold out, but you can still purchase a shuttle pass to get here. No vehicles will be permitted on COTA Blvd without a valid parking pass. Gates to the Circuit open at 8AM Saturday, 9AM Sunday. Track activity will continue throughout both days before ending at 4:35PM on Saturday, 4PM on Sunday. The gates to the Super Stage are tentatively slated to open at 5:30PM, however this time is subject to change due to the logistics of converting a Formula 1 track to a concert venue. 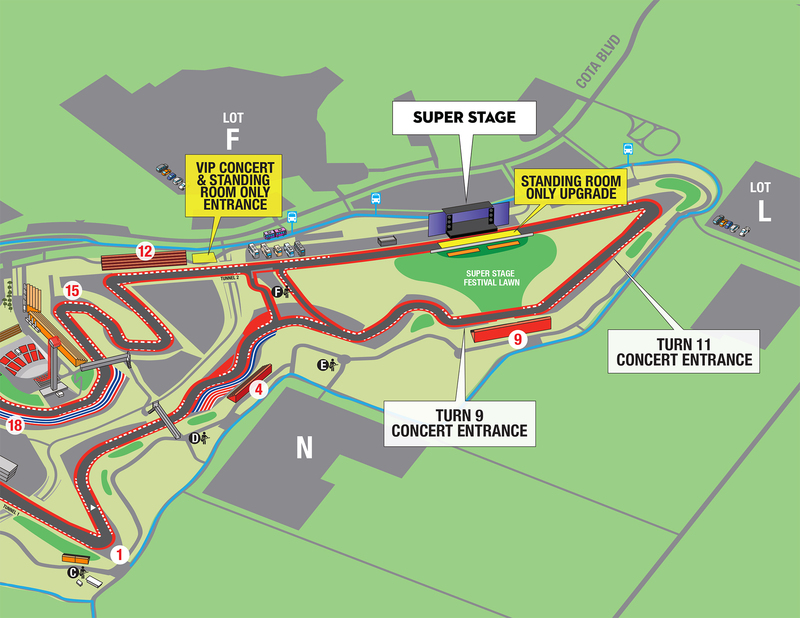 General Admission - GA guests will enter the Super Stage area from Turn 9 and Turn 11. VIP and Upgrade - Standing Room Only and Bleacher Upgrades will enter from Turn 12. The following items will not be permitted inside the gates of Circuit of The Americas during the Formula 1 USGP. In addition to items specifically listed here, other items that may be deemed to present a potential hindrance or threat may also be prohibited. In an effort to keep all of our guests safe, all patrons will have to go through a security screening process before entering the grounds. Unfortunately battery packs, lights and loose wires will not pass the security screening. Thank you for your understanding and enjoy the show! Camera lenses longer than 10"
Posters and flags larger than 11"x17" will not be permitted in the upgrade areas or standard general admission area during the concerts. NOTE: All bags, purses and backpacks will be screened and persons will be scanned by security personnel. Fans without bags are encouraged to use our “No Bag Lanes” to expedite the process. Guests entering Circuit of The Americas should prepare accordingly. With backpacks and cameras prohibited in the standing and bleacher upgrade areas, we recommend storing them in your vehicle if you've parked on site. Alternatively, you may check a bag or camera at any one of our guest services booths set up throughout the Circuit. We will securely store your belongings in a locked space while you enjoy the concerts, and you can pick them back up afterwards. Both the general admission and upgrade areas will have food and drink available for purchase. Food and drink purchased at other locations around the Circuit will be permitted into the concert areas. For those who are bringing refillable water bottles, we will have a free water refill station. The Super Stage is ADA compliant. Please review our ADA accessibility information here or send us an email at ada@circuitoftheamericas.com to coordinate.